Discover out-of-the-way places like Chillon Castle and St Pierre Cathedral. Deepen your sense of the past at sights like Corniche Lavaux Vineyards and Basilique Notre-Dame de Genève. Change things up with these side-trips from Geneva: Vieille-Ville de Montreux (in Montreux) and Lavaux Vinorama (in St-Saphorin-Lavaux). 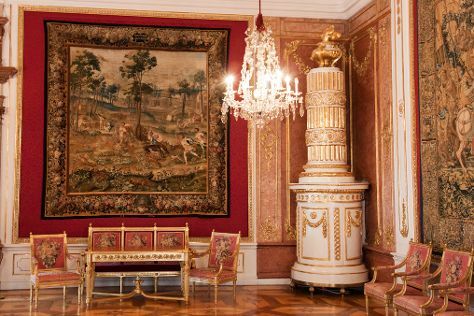 There's still lots to do: ponder the design of The Geneva Water Fountain, examine the collection at Musée Ariana, take a stroll through Vieux-Carouge, and take in nature's colorful creations at Jardin Anglais. For reviews, ratings, where to stay, and more tourist information, read our Geneva travel itinerary planner. If you are flying in from France, the closest major airports are Geneva Cointrin International Airport, Bern Belp Airport and Basel Mulhouse Freiburg. In December in Geneva, expect temperatures between 5°C during the day and 0°C at night. Finish your sightseeing early on the 21st (Thu) to allow enough time to travel to Freiburg im Breisgau. Start off your visit on the 21st (Thu): admire the landmark architecture of Freiburger Münster, steep yourself in history at Historisches Kaufhaus, then pause for some serene contemplation at Church of St Peter im Schwarzwald, then admire the masterpieces at Augustinermuseum, and finally get a sense of history and politics at New Town Hall. Keep things going the next day: step into the grandiose world of Rotteln Castle, then explore the ancient world of Burg Baden, then make a trip to Römische Badruine, and finally make a trip to Schloßberg mit Ruine Flochberg. To see photos, more things to do, other places to visit, and tourist information, read our Freiburg im Breisgau itinerary maker. Traveling by car from Geneva to Freiburg im Breisgau takes 3.5 hours. December in Freiburg im Breisgau sees daily highs of 6°C and lows of 0°C at night. Wrap up your sightseeing on the 23rd (Sat) to allow time to drive to Strasbourg. Visit Château du Haut-Kœnigsbourg and Eglise des Dominicains for their historical value. Get a sense of the local culture at Vins d'alsace HORCHER and La Petite France. Explore the numerous day-trip ideas around Strasbourg: Chateau de Kaysersberg (in Kaysersberg), La Grand-Rue (in Ribeauville) and Old Town (in Turckheim). There's still lots to do: steep yourself in history at Cave Historique des Hospices de Strasbourg, step into the grandiose world of Chateau du Haut-Barr, and contemplate in the serene atmosphere at Eglise Saint-Thomas. For maps, reviews, ratings, and tourist information, you can read our Strasbourg holiday planner. Getting from Freiburg im Breisgau to Strasbourg by car takes about an hour. Other options: take a bus; or take a train. In December in Strasbourg, expect temperatures between 6°C during the day and 0°C at night. Wrap up your sightseeing by early afternoon on the 26th (Tue) to allow time for the car ride to Salzburg. Start off your visit on the 27th (Wed): examine the collection at Haus der Natur, then don't miss a visit to Stiegl-Brauwelt, and then examine the collection at Red Bull Hangar-7. Keep things going the next day: examine the collection at DomQuartier Salzburg, admire the landmark architecture of Fortress Hohensalzburg, then take in the exciting artwork at Residenzgalerie, and finally admire the landmark architecture of Salzburg Cathedral (Dom). To find maps, photos, traveler tips, and more tourist information, use the Salzburg vacation builder. You can drive from Strasbourg to Salzburg in 5 hours. Alternatively, you can take a train; or do a combination of train, bus, and flight. In December in Salzburg, expect temperatures between 6°C during the day and -1°C at night. Finish your sightseeing early on the 28th (Thu) to allow enough time to drive to Ljubljana. 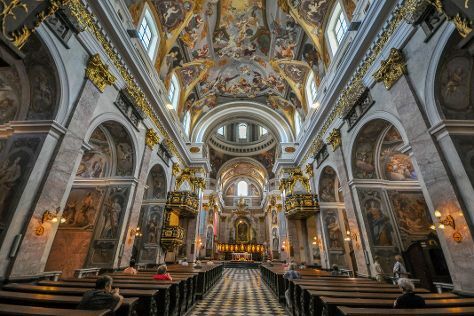 Start off your visit on the 29th (Fri): step into the grandiose world of Ljubljana Castle, take in the spiritual surroundings of Cathedral of St. Nicholas, then wander the streets of Ljubljana Old Town, and finally take in the spiritual surroundings of Franciscan Church (Franciskanska cerkev). On the next day, step into the grandiose world of Bled Castle (Blejski Grad), explore the activities along River Ljubljanica Kanal, and then test your problem-solving skills at popular escape rooms. For reviews, maps, traveler tips, and tourist information, refer to the Ljubljana vacation builder. Traveling by car from Salzburg to Ljubljana takes 3 hours. Alternatively, you can take a train; or do a combination of shuttle, flight, and train. In December, daily temperatures in Ljubljana can reach 3°C, while at night they dip to -3°C. Wrap up your sightseeing on the 30th (Sat) to allow time to drive to Budapest. You'll discover tucked-away gems like Hospital in the Rock - Bunker and Room Escape Games. Get some cultural insight at St. Stephen's Basilica (Szent Istvan Bazilika) and Fisherman's Bastion. There's lots more to do: admire the landmark architecture of Matthias Church, get a sense of history and politics at Residence Parliament, pause for some photo ops at Shoes on the Danube Bank, and examine the collection at House of Terror. For photos, where to stay, reviews, and more tourist information, read our Budapest trip planner. You can drive from Ljubljana to Budapest in 4.5 hours. Other options are to take a shuttle; or fly. Expect a daytime high around 4°C in December, and nighttime lows around -2°C. Wrap up your sightseeing by early afternoon on the 4th (Thu) to allow time for travel to Prague. Your inner history buff will appreciate Prague Astronomical Clock and Lobkowicz Palace. Do some cultural sightseeing at St. Vitus Cathedral and Old Town Square. 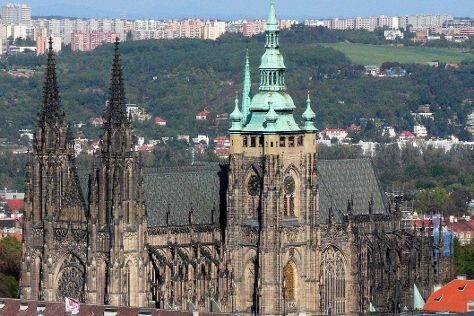 And it doesn't end there: appreciate the extensive heritage of Prague Castle, take a stroll through Old Town (Stare Mesto), take in the architecture and atmosphere at Kostel Panny Marie Pred Tynem, and don't miss a visit to Charles Bridge. To see reviews, photos, and tourist information, read Prague holiday planner. You can do a combination of bus and flight from Budapest to Prague in 5 hours. Other options are to drive; or do a combination of bus and taxi. January in Prague sees daily highs of 1°C and lows of -3°C at night. Finish up your sightseeing early on the 7th (Sun) so you can travel to Montpellier. Do some cultural sightseeing at Palais des Papes and Amphitheatre (les Arenes). You'll explore the less-touristy side of things at Arenes de Nimes and Eglise St-Trophime. Get out of town with these interesting Montpellier side-trips: Chateau de Tarascon (in Tarascon), Paroisse Saint Nazaire (in Beziers) and Pont d'Avignon (in Avignon). There's lots more to do: explore the historical opulence of Chateau de Peyrelade, take in the spiritual surroundings of Cathedrale St-Pierre, do a tasting at La Maison Noilly Prat, and take in the architecture and atmosphere at Abbaye Saint Guilhem Le Desert. To see other places to visit, ratings, more things to do, and more tourist information, go to the Montpellier travel itinerary creator. Traveling by combination of train, flight, and bus from Prague to Montpellier takes 7.5 hours. Alternatively, you can drive; or take a train. Traveling from Prague in January, expect Montpellier to be somewhat warmer, temps between 14°C and 3°C. Wrap up your sightseeing on the 11th (Thu) early enough to drive back home.